Those were the words of the new heavyweight champion of the Ultimate Fighting Championship (UFC) this Saturday after his historic upset over the favored ex-champ Brock Lesnar. Lesnar had been the #1 ranked heavyweight in the world by Sherdog and MMA Weekly prior to be pounded out with one minute left in the first round by the 30 pound smaller Velasquez. Needless to say, thousands and thousands of Latino and non-Latino supporters erupted in applause at the spectacular win. Mexican flags and pro-Velasquez banners were commonplace among the 14,000 plus fans that packed Anaheim’s Honda Center. 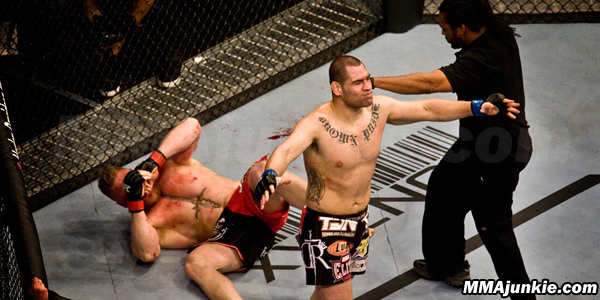 The media pitch for this event, spearheaded by the UFC’s head figure Dana White, was the story of Velasquez, “Brown Pride” tattooed across his chest, trying to defeat the purportedly unstoppable force that was Brock Lesnar to become the first Mexican-American heavyweight champion. Prior to the fight at a press conference, one reporter tried to get the fighters to respond to a question regarding their stance on the anti-immigrant SB1070 passed in Arizona recently. Undoubtedly those hardships must have shaped Velasquez, and those of us anti-racists in the MMA community can only thank him for speaking out when some other athletes would have chosen not to. Interestingly, this was one of the first times that nationality was used so explicitly and overtly to sell a UFC event. Despite past attempts with fighters like Roger Huerta to break into the Latino market, every UFC commercial and blog mentioned the fact that Velasquez could be the “first Mexican-American heavyweight” ever. So, for the UFC to highlight Velasquez’s Mexican-American heritage seems like a progressive leap within the world of MMA. “The guy's Mexican. His parents came here from Mexico (and) came over the border. ... Do you think we had him tattoo 'Brown Pride' on his chest? What the [expletive]?" Dana White so eloquently told reporters after the fight. Some, of course, criticized the media blitz for using his nationality to sell the UFC to Latinos. White did not reject this idea. He admitted that Velasquez could provide a serious opening for the UFC to enter the Latino community, adding that this fight as a “big deal” and could be a watershed moment. Doesn’t sound like a bad thing, right? Think again. White’s comments are a classic example of a CEO talking out of both sides of his mouth. While he is attempting to break into the Latino market and paint himself as a crusader for the Mexican-American fighter, he is also moving to get MMA shows for the first time in Arizona, the very state where the most racist and vile form of bigotry is alive and well in the form of SB1070. The utter hypocrisy on display could not be more obvious. Arizona's SB1070 is a law that will authorize officers to pull over, question, and detain anyone they have a "reasonable suspicion," including skin color, to believe is in this country without proper documentation. This is a law meant to legalize racial profiling and increase the harassment of Arizona residents and anybody who visits the state, including MMA fighters, their families and fans. MMA is one of the fastest growing sports in the world, with a wide array of Latino and Latino-American fighters. White is trying, with one already in the works for December 2010, to bring large-scale events to Arizona which could bring millions of dollars in revenue to a racist state. Meanwhile, he’s selling his brand to Latinos in hopes that they will not smell the rottenness of the deal they are getting sold. White could care less about discrimination or racism against Latinos, he only cares about how much of their money he can strip from their wallet. This, of course, is the essence of capitalism. Due what is best for the bottom line, not what is best for human beings, even if these human beings are some of the most important people in your business. Every anti-racist should celebrate the victory of Velasquez, in the same way that anti-racists would celebrate the whooping of James Jeffries by Jack Johnson. We should not, however, be duped into thinking that Dana White gives a damn about Latinos.